John Lewin arrived in New South Wales in 1800 with an innate curiosity about the natural world. He made a large number of botanical drawings and collected specimens that formed the basis of two of the earliest books on the fauna of the colony. 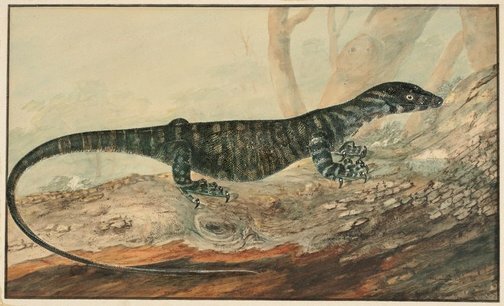 'The Variegated lizard of New South Wales' is one of a number of drawings Lewin made for Governor Bligh. Its high state of finish and landscape setting suggest it was intended for public view and is among a number of presentation drawings Lewin made during his career. Signed and dated l.r., pen and black ink "JW Lewin A.L.S./ Dem. 23. 1807". Tim Bonyhady, The colonial image: Australian painting 1800-1880 , Canberra, 1987, 7 (colour illus.). 19th century Australian watercolours, drawing and pastels from the Gallery's collection , Sydney, 2005, 19 (colour illus.). The new McCulloch's encyclopedia of Australian art , Carlton, 2006, 613 (colour illus.). Barry Pearce, Australian art: in the Art Gallery of New South Wales , 'Introduction', pg. 10-16, Sydney, 2000, 10, 17, 19 (colour illus. ), 301. Drawing in Australia: drawings, water-colours, pastels and collages from the 1770s to the 1980s , Melbourne, 1989, 21 (colour illus. ).